Richa Singh received a Ph.D. degree in Computer Science from West Virginia University, Morgantown, USA in 2008. She is currently an Associate Professor with IIIT Delhi, India, and an Adjunct Associate Professor at West Virginia University. She is a Fellow of IAPR and Senior Member of IEEE and ACM. Her areas of interest are pattern recognition, machine learning, and biometrics. She is a recipient of the Kusum and Mohandas Pai Faculty Research Fellowship at the IIIT Delhi, the FAST Award by the Department of Science and Technology, India, and several best paper and best poster awards in international conferences. She has published over 225 research papers in journals, conferences, and book chapters. 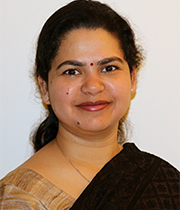 She is also an Editorial Board Member of Information Fusion (Elsevier), Associate Editor of Pattern Recognition, CVIU, IEEE Access, and the EURASIP Journal on Image and Video Processing (Springer). She has also served as the Program Co-Chair of IEEE BTAS 2016, IWBF 2018, and General Co-Chair of ISBA 2017. She is currently serving as Program Co-Chair of International Conference on Automatic Face and Gesture Recognition, 2019.